How wonderful that you have arrived here, in Explore & Study Gurumayi's Message for 2019! I want to extend a warm welcome to you and thank you for coming. These pages have been designed to make available copious resources for your study, practice, assimilation, and implementation of Gurumayi's Message for 2019. These study tools will be available on the Siddha Yoga path website throughout the year. One of the key study tools that you are able to register for is The Workbook on Gurumayi's Message for 2019. The Workbook is based on a series of questions given by Gurumayi. Each week you will be surprised with a new question, along with exercises and activities to focus and enhance your study. And there will be much, much more! So any time you wish to jazz up, freshen up, or add a little extra oomph to your practice of Gurumayi's Message and to your Siddha Yoga sadhana, you know what to do! Visit Explore & Study Gurumayi's Message for 2019. Come to these pages on a daily basis and avail yourself of the plenitude of resources that you will encounter here. Vimarsha began practicing Siddha Yoga in 1984. He is a Siddha Yoga meditation teacher who lives in Mexico City and serves as a home sevite in the SYDA Foundation Content Department. Currently he edits the minisite on the Siddha Yoga path website titled “Explore and Study Gurumayi’s Message for 2019.” In addition he serves as a music coordinator and musician at the Siddha Yoga Ashram in Mexico City. Vimarsha served on staff at Shree Muktananda Ashram from 1996–2008, and during this period he helped coordinate activities for teens and young adults. He also managed departments and projects for a variety of activities, including SYDA Foundation global operations and educational initiatives. Vimarsha has offered seva for many years in nearly every department at the Siddha Yoga Ashram in Mexico City. 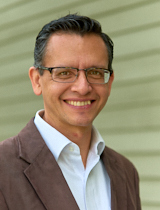 He is a licensed psychologist and educator, and earned his degree from the Universidad Intercontinental, Mexico City.